After the shocking revelations of the previous episode, “Drive with a Dead Girl” should provide second part of a one-two punch. 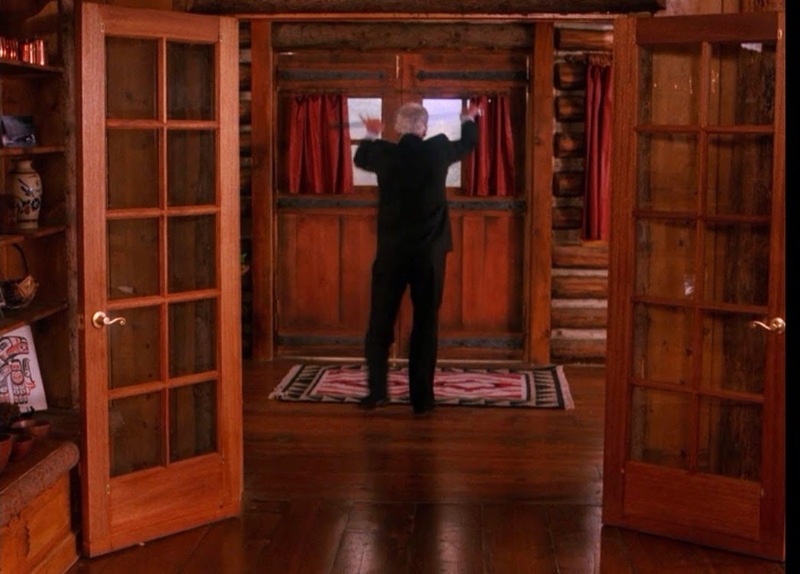 But, as Twin Peaks is both a David Lynch show and a network drama, this episode is all about delay and a refusal of pure catharsis. Some stories may end, but other just keep spinning. Or maybe I should put it this way: some mysteries are solved, but all the other stories just happen over and over again. This episode repeated many elements from earlier in the series: We’re reminded by Agent Dale Cooper’s large bandage that he was recently shot. 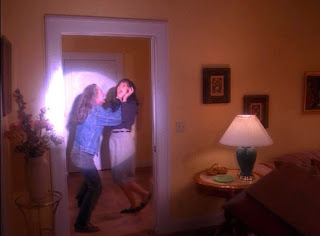 Maddie’s body is discovered, much like Laura’s. Someone else is in the jail cell we first saw back when Mike and Bobby were suspected of Laura’s murder. Ben and Jerry’s extended mutual memory of watching a young girl dancing with a flashlight in their bedroom is new to us, but a sign that memories can have the vividness of present reality. I’m going to suggest that there are two reasons for this repetition, one in-show and one meta. On the in-show level, evil will continue to repeat itself until Mike Gerard defeats Bob the Evil Demon (who currently resides, of course, in Leland). But on the meta level, everything will repeat because that is the nature of a soap opera: the same stories happening, with slight variation, to different characters. Leland then turns to the camera, as though to say: "Here, viewer! Here's your answer!" 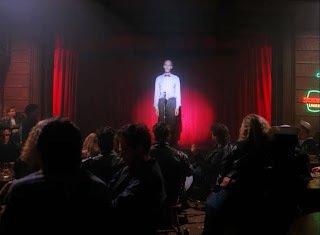 That spotlight echoes what Cooper, at the Roadhouse, saw onstage: the Giant telling him that this is happening again. 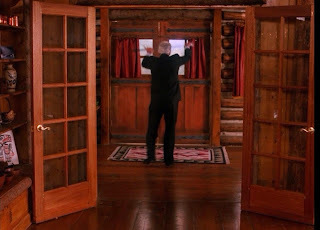 That is, Bob’s existence reminds us that, in the world of the show, there is another world in which contains the darkest evil—the world that Bob comes from, the world of the Red Room and the White Lodge. But, in the viewer’s real world, that Evil Place is on TV. We’re the audience to evil, just as Cooper is the audience to the giant. 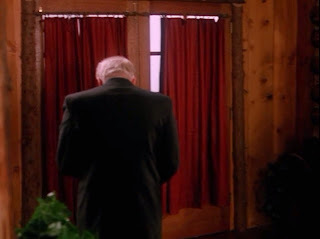 And, like Cooper, we’re left with the sense that something has not yet been truly revealed. And reminds us that life keeps happening in the middle of tragedy all the time. This episode revisits numerous mini-plots: Norma’s mom comes to town, and so does a food critic. Shelly and Bobby are still trying to make a go of it. Donna and James seem to have made up. And Laura’s mother Sarah Palmer has, once again, forgotten her husband’s inner demon. Same old story. Over two years have passed since my previous Twin Peaks review. Jumping back in was an odd experience, particularly because I had remembered more happening in this episode than did actually happen. With the big reveal of Laura’s killer out of the way, Twin Peaks will vacillate between a state of “wow, nothing happened” and “wow, more happened than I thought” for the rest of the season. Some of it is bad. Some of it is epic. And all of it is, I promise, coming soon. • This section might have to disappear for a while, since we know the central mystery of the show now. 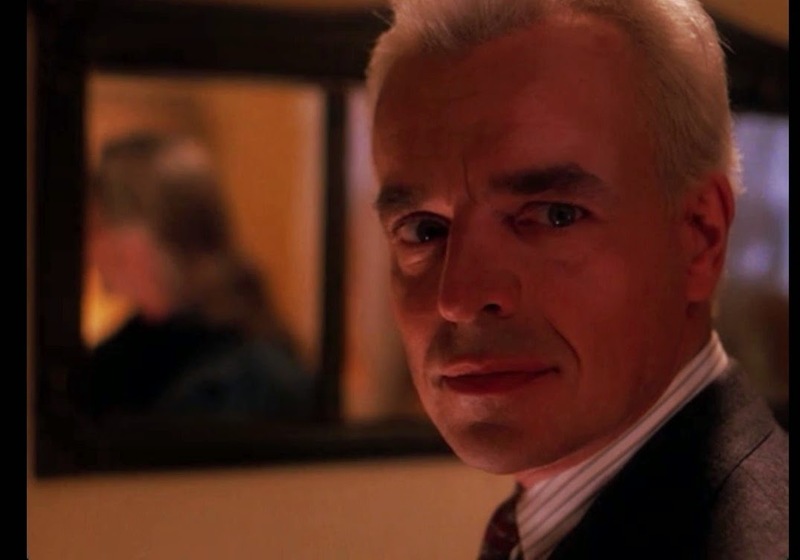 But let's take a minute to wonder why Ben never outright denied killing Laura Palmer to Sheriff Truman. • And, hey! Did we know about the arson before? I honestly don't remember. • Gee, I wonder who this mysterious food critic will turn out to be. Three out of four overcooked salmons running upstream and thinking of spawning. 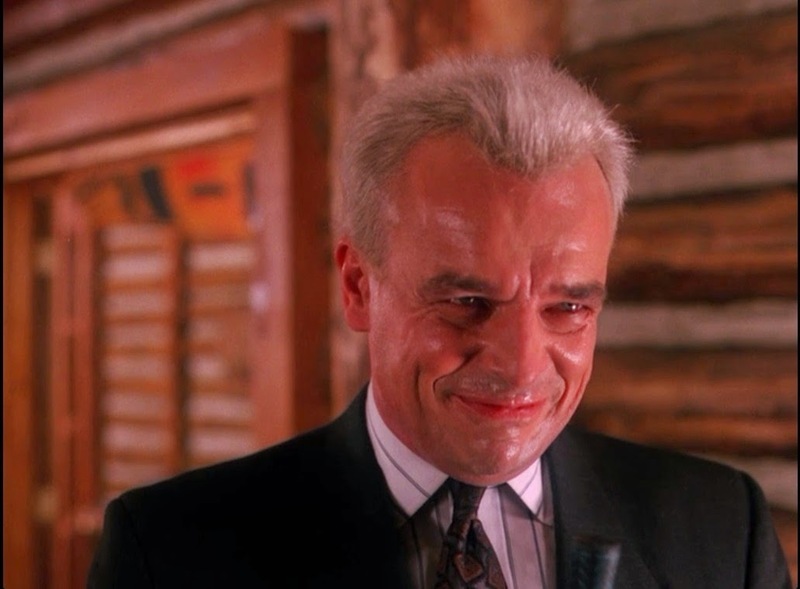 Yay for more Twin Peaks! and I have to say, the top right photo actually made me laugh out loud. Great choice. 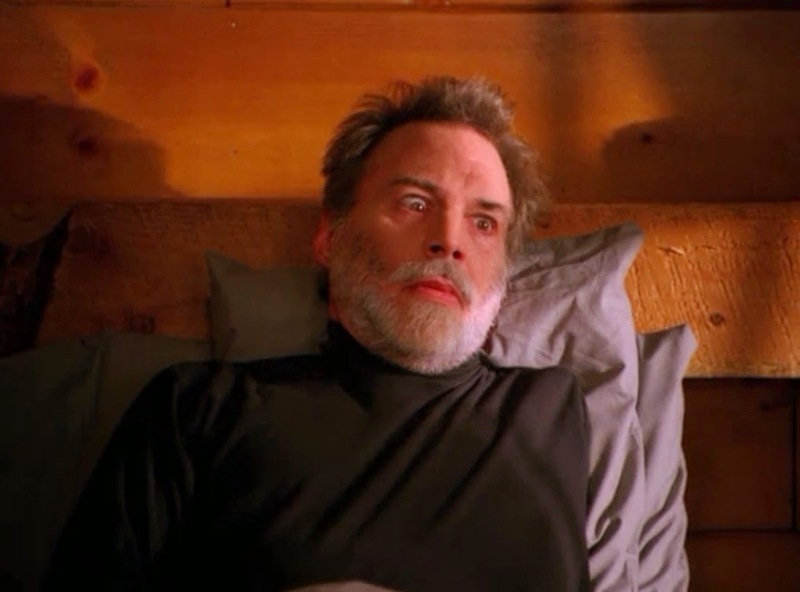 One thing that struck me in this episode was Leland/BOB offering to show his "golf clubs" to Cooper (really Maddie's dead body). At the same time, he's holding an iron in such a way that clearly shows he is ready to kill Cooper right now--and while Sheriff Truman is at his truck, far enough away to draw his gun and shoot Leland/BOB. 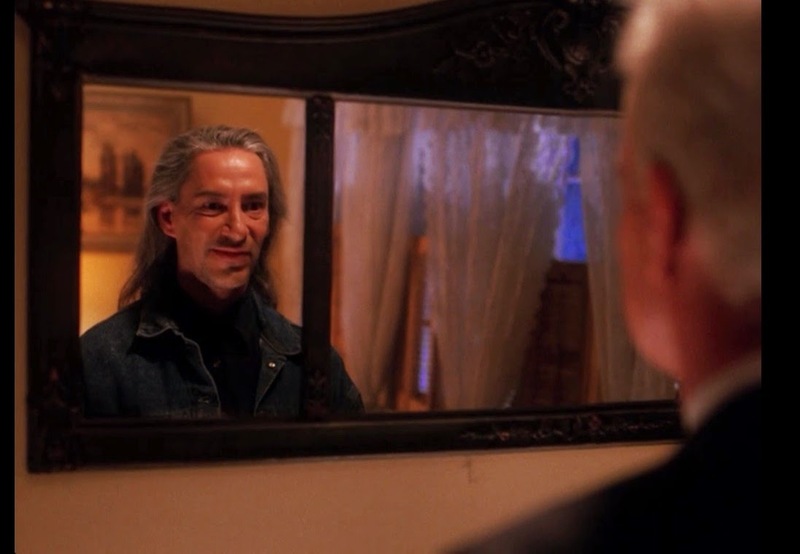 This seems to imply that BOB is willing to sacrifice his Leland disguise in order to kill Cooper. Later we learn that Leland is "full of holes" and thus BOB feels that Leland's usefulness is coming to an end anyway--but I wonder why killing Cooper suddenly seems so attractive? Leland/BOB has a plan to frame Ben Horne for Maddie's murder, and Ben is already in custody for Laura's murder--so why suddenly throw all that away by impulsively killing Cooper? This touches on a philosophical point about the Lodges and their spirits: time seems to be non-linear in the spirit world, so do the spirits have knowledge of future events (as it sometimes appears) and, if so, how much knowledge do they have? If they have perfect knowledge, then everything is predetermined and there is no uncertainty. This does not seem to be the case, as MIKE is pursuing BOB which implies that he doesn't know if/when he might catch him. On the other hand, spirits sometimes say "I can't reveal that now" which begs the question "Why not?" Either revealing it now causes a less desirable outcome (which implies some foreknowledge), or there are 'rules' about what can and cannot be revealed and when (and in this case, who is making the rules? ).